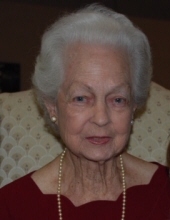 Mary Jones Parker went home to be with the Lord on February 9, 2019, and was reunited with her beloved husband of more than 62 years, Guy Parker. Mary Helen Jones was born November 2, 1927, in Atlanta, Georgia, to George D. and Ione Jones. Mary is survived by her daughters Jean Parker Thompson (Robert) of Peachtree City, Georgia, and Joan Parker Robinson (Ron) of Colorado Springs, Colorado. She leaves behind five grandchildren, Matt Thompson (Lori), Brent Thompson (Natalie), Abby Thompson, Rex Robinson (Ane), and Jay Robinson, and four great-grandchildren, Keeley and Zoey Thompson and Bryce and Carly Thompson. She is also survived by her brother John Jones (Barbara) of Temple, Georgia, her sister Sarah Johnson of Kermit, West Virginia, and numerous family members. Mary graduated at age 15 from Russell High School, East Point, Georgia, completed her business studies program, and worked as a secretary before marrying Guy Parker on Christmas Day 1945. Mary and Guy enjoyed traveling throughout the United States in their Airstream and being active in their churches (First Baptist of East Point and later First Baptist of Peachtree City). Mary was involved in music programs as a pianist, taught Sunday School, and led various youth activities. She was a voracious reader and accomplished photographer, seamstress, cook, and hostess. Her family and friends were the happy beneficiaries of her talents. Mary’s long and well-lived life is a gift and example for all who loved her. The family will receive visitors at Carl J. Mowell & Son Funeral Home in Peachtree City, Georgia, on Monday, February 11 from 5 pm to 8 pm. Funeral services will be held at First Baptist Church of Peachtree City on Tuesday, February 12 at 11 am. Interment will follow at College Park Cemetery. Expressions of sympathy may be made in the form of donations to the Lottie Moon Christmas Offering, c/o First Baptist Church, Peachtree City, GA (www.fbcptc.org). To send flowers or a remembrance gift to the family of Mary Parker, please visit our Tribute Store. "Email Address" would like to share the life celebration of Mary Parker. Click on the "link" to go to share a favorite memory or leave a condolence message for the family.